The Chicken, the egg or responsibility, what came first? Of all my duties here at the ranch, one that embodies the lessons of responsibility I have learnt is the chickens. Initially I thought that this was a lesser task, a menial duty that had little impact on the ranch. However, I was quickly proven wrong and realized how much of a commitment it is to caring for the chickens here. Each morning I needed to investigate the coop and check on the chickens, which alone became a daily responsibility. Alongside this I was to provide the chickens their food and water supply each morning without fail. This was something I could not neglect as it would cost the chickens greatly. This may seem an exaggeration but it is undoubtedly a test of responsibility. Should I have ever forgot to feed them or provide water, this would show a lack of responsibility on my part. One mistake would have major repercussions on the health of the chickens and so by making this a daily responsibility I came to see how important it is to always follow through with such things. It was entirely down to me to then let the chickens out each morning during the warm season and provide food to them. I was to constantly count them and ensure all chickens were safe, each and every one. Once the night came I was expected to have the chickens all inside the coop by a certain time with an adequate food and water supply. This involved ensuring all chickens were accounted for, none could be neglected. I could not ignore even one, that would have been an incomplete job and so a failure of my personal responsibilities. The aforementioned duties were highlighted even more so once the winter season began to set in. With the temperatures falling this meant I had to ensure the water supply would not freeze and that the coop maintained a warm temperature for the chickens. This would not fulfill itself and was again my personal responsibility, should I have done nothing, the chickens would have no water and very likely freeze to death. Caring for the chickens was not to be taken lightly and with the changing circumstances due to winter, I saw how responsibility meant being able do adapt, to find alternatives whilst never neglecting your job. A combination of the cold and chickens taught me that. How inspiringly peculiar. As well as the chickens themselves, I also had the daily duty of collecting eggs and occasionally maintaining the cleanliness of the coop. These together show that caring for chickens is no basic task. It is a compilation of duties and responsibilities, each and every one a test of my own personal commitment to my job. Should I neglect even one it would have a notable impact. I was not asked or reminded to carry out these duties, that responsibility was my own and I knew it. By taking onboard all these duties I saw through the chickens how important it is to be committed to all aspects of your job. One neglectful act will have consequences. 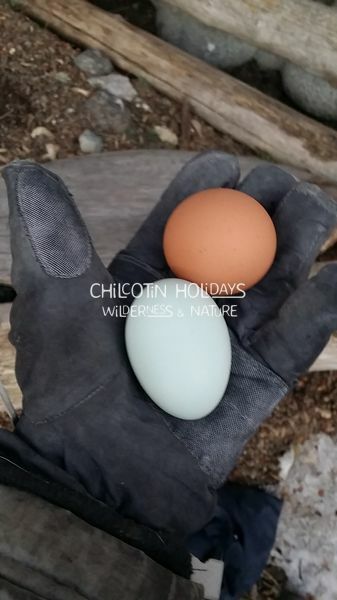 And so, and with thanks to the chickens of Chilcotin Holidays, I have an understanding of true responsibility. It seems responsibility comes before the chicken and the egg.